Getting your kiddos excited about science and exploration shouldn’t stop at the classroom. Finding new ways to show your family the world around them is fun, and you all get to learn a lot about how things work in the process. It’s a win-win, really. As for discovering how the world works, what’s better than engineering projects that stretch your kids’ minds creativity and problem-solving skills? That’s right, not a whole lot. Here are three of our favorite easy engineering projects for kids. The egg drop challenge is a grade school classic. If you haven’t heard of it, the premise is simple. Participants (kids and adults) have to create a container that will protect an egg from a fall. That’s it! By switching up the materials, adding time limits, and changing the fall distance, you can customize the activity for different age groups. Distribute the materials to the participants. The materials and quantities can differ depending on what you have available. Just make sure that all participants have equal access to materials. Set a time limit. This step is optional, but it makes the project more competitive. When the time limit is up, have the participants take turns dropping their eggs from a predetermined height. After you drop the egg, check and see if it’s still intact. If the egg is cracked, the participant is eliminated. If participants are all successful, you can also challenge them to make numerous functional containers within a particular time period. The foil boat float is the easiest challenge to prepare. You only need two household items, and the goal is simple: participants have to create a boat out of aluminum foil. In order to win, the boat cannot tip over or take on water. Distribute the materials to the participants. Let the participants know that the boat must be no larger than 6 x 6 x 6. If your kids are young, consider providing them with rulers. When the boats are ready, set them on the water. The boats should be able to float without tipping over or taking on water. If there are multiple boats that meet these criteria, begin adding one penny to each boat. The boat that can hold the most pennies without sinking is the winner. This project is less competitive than the first two, but it can be completed with common household items. It also takes a long time. In a nutshell, participants have to create a working oven out of common household items. This project is easy and works best during the summer months. Place a few a sheets of newspaper in the bottom of a pizza box. This will help to insulate your solar oven and protect your food from old pizza grease. Cover the newspaper with black construction paper. The color black absorbs all forms of visible light, so it’s great for keeping in heat. Cut a flap out of the top of the pizza box. The incisions should be two inches from the sides and front. After making three cuts, fold this flap backward and cover the inside with aluminum foil. The foil should reflect sunlight into the solar oven. After folding back the flap, tape plastic wrap across the opening. This step prevents airborne particles from falling into your food. Place your food into the solar oven. If you’re working with children, smores are the perfect confection. Tape the flap open in a way that reflects sunlight onto your food. Put your food into the pizza box and close it. Check on your food every 15 minutes. You’ll also want to make sure that your oven stays out of the shade. If you want to make this activity more competitive, you can measure the temperature and cooking times of various solar ovens. Since the groundhog predicted six more weeks of winter, we’re here to help you get through it. If you’re a new hearing aid user, then there are a few things you should know before you head outside. Winter weather brings significant fluctuations in temperature. When moving from warm to cold temperatures, airborne moisture condenses into water droplets. When these droplets accumulate, they can damage hearing aids and batteries. If you want to build a snowman this winter, just follow these two rules. During the winter, moisture poses the biggest threat to your hearing aid. The first and most obvious form of moisture comes from the sky. If exposed to sleet, hail, and snow, your hearing aid can malfunction from water damage. 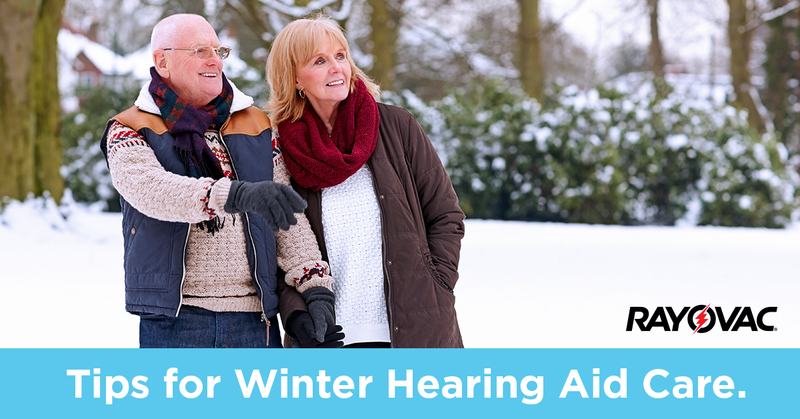 The best thing you can do is cover your hearing aid with a hat or pair of earmuffs. Consider purchasing a hearing aid sweatband. These bands absorb moisture rather than trapping it. They are also perfect for behind-the-ear hearing aids. Dry out your hearing aid regularly. When you get inside, remove your hearing aid and open the battery compartment. If you can see any moisture, wipe it out with a cotton swab. You can also purchase a hearing aid dehumidifier. Place your hearing aid into the dehumidifier before you go to sleep, and let it do its work. When it comes to cold and batteries, there is a lot of conflicting information on the internet. Some sources claim that you should store batteries in the refrigerator, while others say that cold drains your batteries. The truth is your batteries should never be in the fridge. Cold slows the motion of electrons and prevents batteries from working. That chemistry can prevent batteries from working properly during the winter months. If you’ve run into trouble in the cold, here are a few tips that will your batteries working. Avoid storing batteries in your car. The rapid and frequent changes in temperature can cause moisture buildup and damage the battery. Remove your hearing aid when participating in outdoor activities like skiing, sledding, or shoveling snow. This will protect it from unnecessary moisture and cold. Now you’re ready to go walking in a winter wonderland. Just remember these rules, and winter weather will feel like a walk in the park.